I hope you are all having a wonderful weekend. Mine is quite busy because hubby is away so I have some more work to do at home but also I have to fill out thousand pages of documents for the new job. A little hint here, I will be working for the government. When the contract arrived, my eye balls jumped out of my skull, really, you can't imagine how many forms and how many questions it takes to get a governmental position. I have to make my way through those until Tuesday *sigh*. Then I went for shopping, got some more pink champagne which I am sipping while I write these lines. 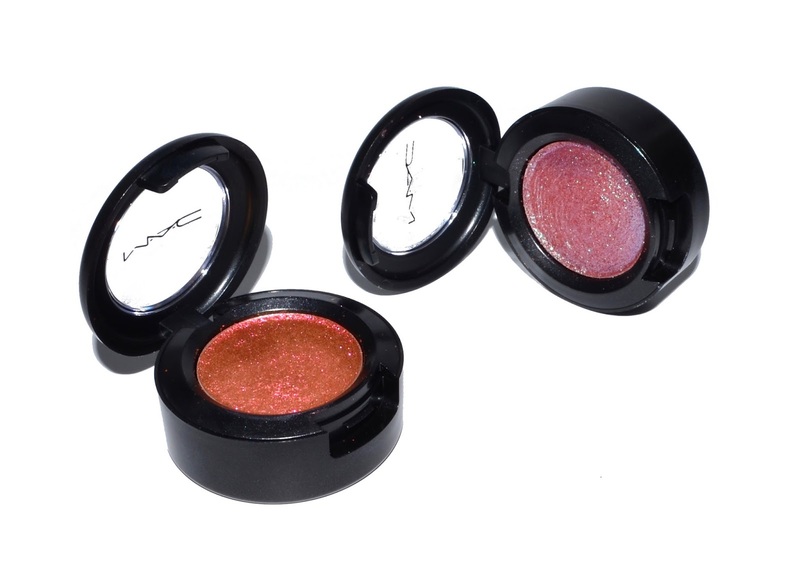 I also purchased one more MAC Dazzleshadow although I was trying to stop myself from doing it. Two of these I purchased earlier are today's topic and it is a mixed bag so why take risk then right? It must be because they are so gorgeous... Let me show you Boom Boom Room and Let's Roll. MAC Dazzleshadows are a new formulation released now as limited edition with MAC Le Disco Collection. 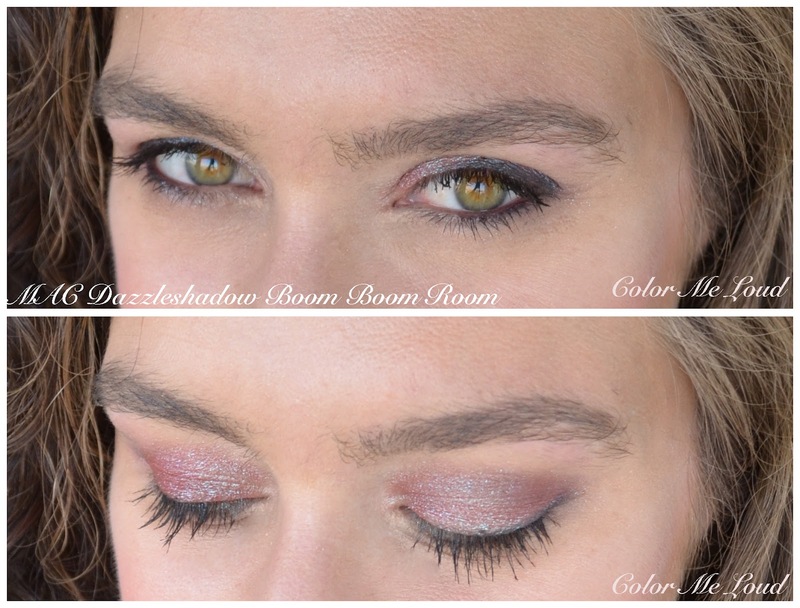 It is supposed to be between their pressed pigments and normal eye shadows. I am not a big fan of their pressed pigments. I reviewed some of them last holiday (here) . They look gorgeous but blending 2-3 colors is very hard and there is significant fall out during the day. Dazzleshadows on the other hand have finer glitter, not as chunky as pressed pigment and most of them have duo chrome effect which leaves you in awe once you swatch them. I don't know about you but when I see something twinkling and changing colors on the back of my hand I am like "Shut up and take all my money!!". Lucky enough the first time I saw Dazzleshadows, hubby was with me. When he is around I can't go all that crazy and he was so nice and wanted to get me one of the shades so I got another shade and could walk away without much damage on the bank account. He also became a very good make-up shopping companion, that is only at times he doesn't get bored. This time he selected Boom Boom Room for me and said "this one is sheerer but very unique". Which is exactly true. Boom Boom Room has an interesting combination of a pink base and a mint green glitter on top. Let's roll is more opaque. It shifts from peach to pink, so the duo chrome effect is subtler. Let me start with Let's Roll. That color ladies and gents, is to die for. I love pinky coraly shades on the eyes. 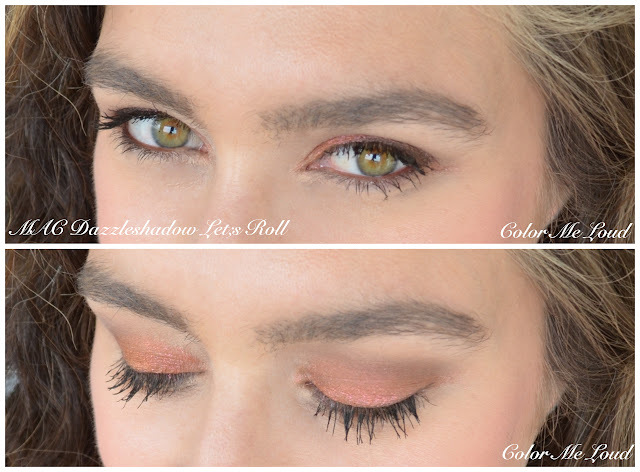 Do you remember this post about wearing coral on the eyes? Now that I can wear subtle corals, I was ready for the next challenge. Bring it full on! Glittery coral, yay! 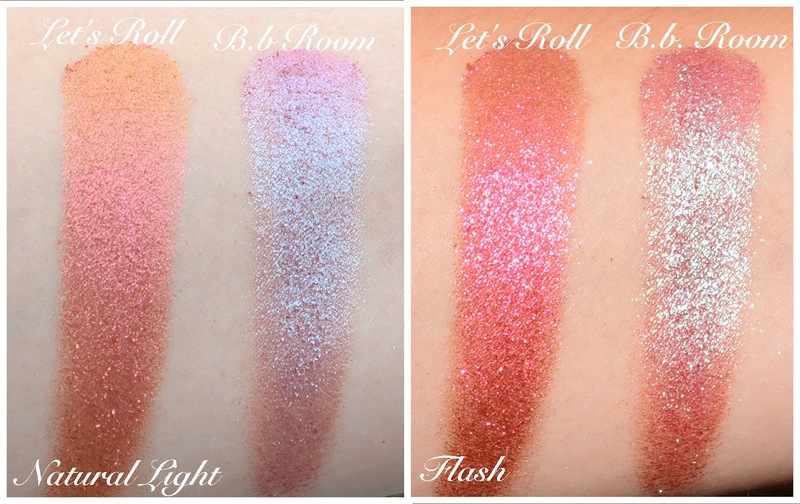 Let's Roll is one of the smoothest of the line, you can see the glitter under the light (like the flash photo above) but normally not that much. During the day fall out from this one is insignificant, so yay! Super in love with this shade and recommend to everyone, especially ladies with green/hazel eyes. 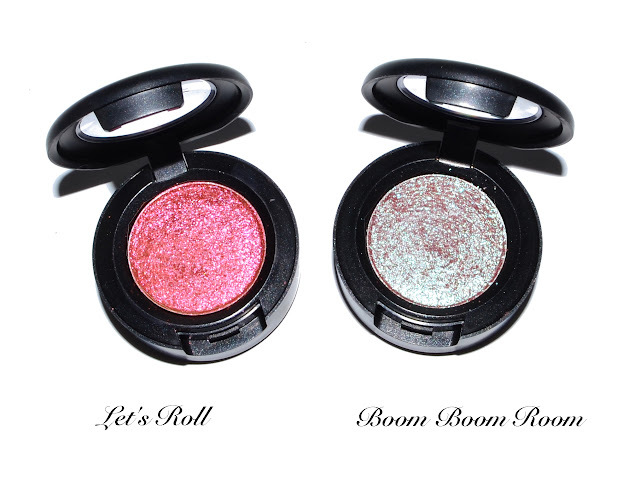 MAC Dazzleshadow in Boom Boom Room was the first one which is the first shade that sold out in Germany. The reason probably is that it has a unique combination of the base and glitter color. How unique we will see in a second but during application, I was not moved by this shade. It was sheer and didn't want to build up. Both of the shades I presented here are applied dry. So there is also that option to go wet and more intense but firstly, I was rushing in the morning, secondly, I was going to work and didn't need full on glam. During the day I found out that the base shade became sheerer and the glitter was awkwardly standing on its own scattered on the lid. It was not all that bad but I was expecting better from the way it swatched. Then I was like wait a minute, have I seen this combination somewhere? When I pulled out Urban Decay Moondust in Solstice, it was clear. They are almost dupes so here is a comparison in case you were wondering. The funny thing is that Solstice has a better color shift, the base is more opaque and it costs less. It also has more product. So if you missed on Boom Boom Room, really there is nothing to worry about. I think Solstice produces a bit more fall out but I tested it again ( I am wearing it at the moment) and all I can say is that it is not bad. Just a slightly more than Boom Boom Room. Check out mel-et-fel for Let's Boogie and She Sparkles and swatches of many other shades from the line at Cafe Makeup. 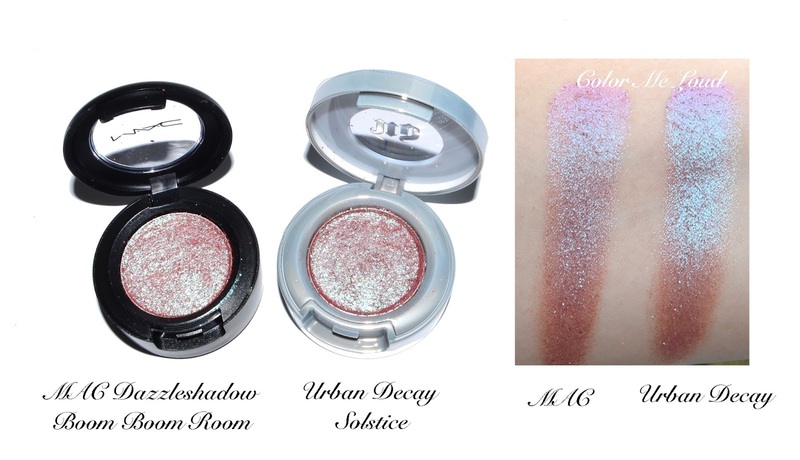 Final thoughts: I love the finish of new MAC Dazzleshadows but Boom Boom Room is a little sheered than I thought it would be, also it is a dupe of UD Solstice which I already owned. Let's Rock on the other hand is pure love for me. All in all, nice but could even be better. Have you checked out Dazzleshadows? What do you think about duo chrome on eyes? Hi Sara, this is a great post. These shades sell out very quickly in Australia and they are $40 each! You’ve made very pretty choices, but we have the same taste in colours! The fact that your husband gives you legit opinion on makeup blows me away, Sara. Just WOW! 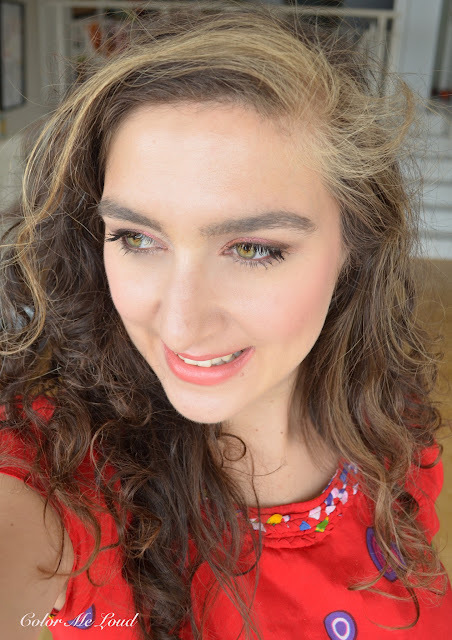 I always like the eye looks you create but this time me eyes went directly to your coral tshirt!! Haha! Very nice and dazzling looks.i like both of them! I' m seriously thinking of buying one or two and maybe say it isn't so also.Do you think these can be combined on an eye look with extra dimension ones as a base? Ooh, I wasn't tempted by these, but your swatches are making them look super interesting! Too bad they were a bit sheer, though! This post makes me all giddy inside because I love sparkly eyes! You picked the best colors, Sara! I know they're slightly sheer but I wonder if you can build it up to a full-on/opaque coverage? That would look totally cool when you blink or close your eyes! Let's Roll matches your top perfectly - love! there is a golden shade in this collection, the base is green. Maybe you don't wear sparkles all that much but that one twinkles so nicely, it was hard to resist, I thought you would love it. Yes UD version of that particular shade is better, you are right. I wish I would have gotten another color instead of Boom Boom Room. Now it is doubled in my collection and the one I already owned was better anyway. Can't stop. won't stop is super pretty (a vivid violet) and I am eyeing I like 2 watch it which has golden sparkle and not usually my color but this one is so pretty under low light. After this post I picked up Slow/Fast/Slow too but didn't try it out yet. I have to stop really, they are pricey but soo pretty agggh. Important note: I wouldn't combine these with any other powder. These need a base (cream or primer) to stick to. On powder they would get loose and sparkle would go everywhere. hold on, your hubby actually said "sheer"?!?? And he buys you makeup!! A real keeper!! Peachy-coral shades don't work all that well on me... but BBR looks interesting! Although hearing your experience... i think i shall pass.